Travis Head has played beyond his years, keeping Australia from total disaster on day two of the first Test against India in Adelaide. 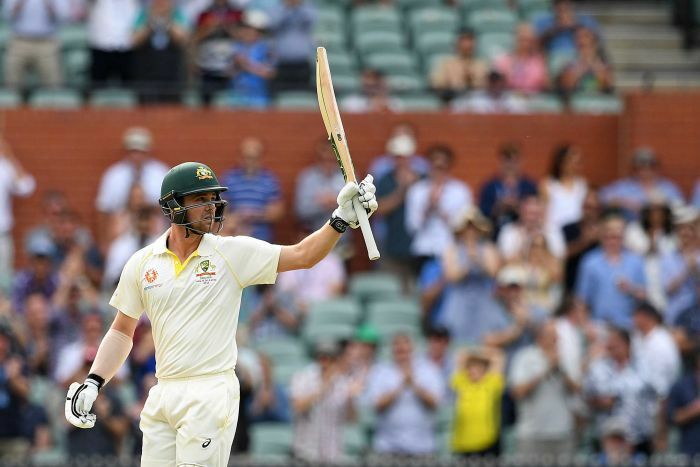 Playing just his third Test, one of Australian cricket’s newest faces showed the more experienced members of his team the way forward, scoring an unbeaten 61 (off 149) in guiding Australia to 7-191. Australia still trails India by 59 runs after a slow day’s play, but with top-scorer Head still at the crease, it has a good chance to earn a first-innings lead on day three. Head, the youngest man to captain South Australia, did not put on a fireworks display for his hometown fans, but played the sort of watchful and — more importantly — lengthy innings that so few players have been able to replicate in this game. He came to the crease with his team struggling at 4-87 and batted patiently from the start of his innings to make it through the rest of the day. Earlier, India’s innings was rapidly quashed first thing in the morning, when Josh Hazlewood (3-52) dismissed Mohammed Shami (6) with the first ball of the day to leave the visitors with a total of 250. India responded with a wicket of its own in Ishant Sharma’s (2-31) opening over, with Aaron Finch skittled by the third delivery to leave Australia at 1-0. Debutant Marcus Harris (26) and first drop Usman Khawaja (28) set about building solid Test innings in the fashion of Cheteshwar Pujara’s patient century on Thursday, but neither could turn their solid starts into big scores. Harris fell for 26 from 57 balls when finger spinner Ravi Ashwin (3-50) got him to pop up a catch to silly mid-off with a skidding delivery. 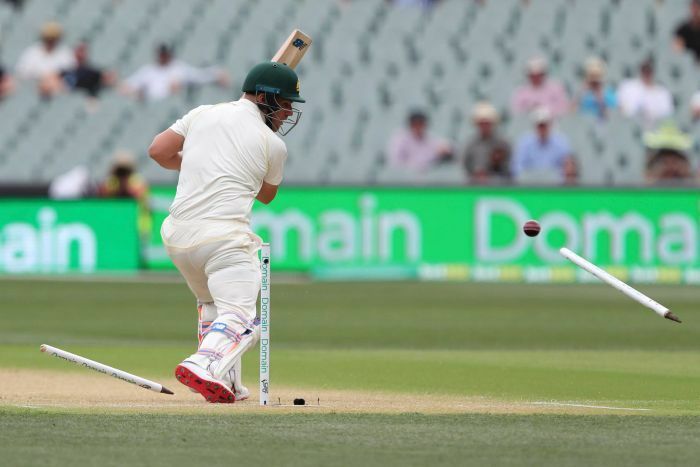 Shaun Marsh and Khawaja made it to the lunch break, but the West Australian provided plenty of fuel for his critics when he was dismissed playing a shocking shot — lashing at a wide ball from Ashwin and chopping on to his stumps. The innings of just 2 continued Marsh’s abysmal recent record in Tests — he has now been dismissed in single figures six innings in a row. Khawaja looked well in control but was marched by the DRS after initially being given not out caught behind off Ashwin’s bowling. Replays showed the spinning delivery caught the thumb of Khawaja’s bottom glove. Local hero Head joined Peter Handscomb (34) at the crease and the pair put on 33, but just when Handscomb looked to be opening his shoulders he played a lazy cut shot and edged to Rishabh Pant in the slips. 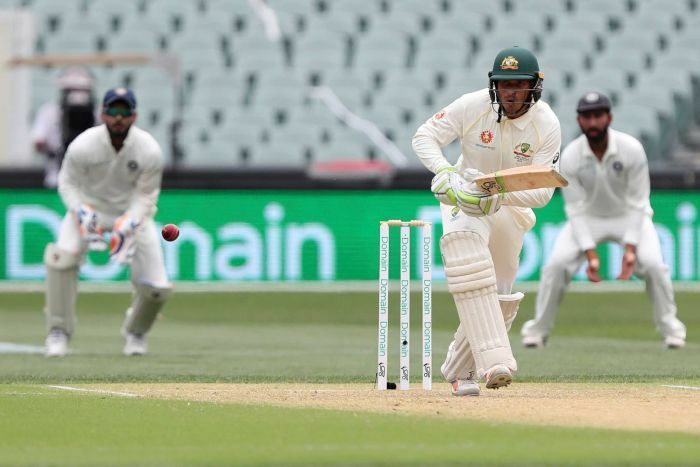 Australia needed a dogged innings from its leader, but Tim Paine could offer no more than 5 runs from 20 balls before he was out caught behind to a straight Sharma delivery to leave Australia six wickets down and still trailing by 123. Pat Cummins linked with Head for the biggest partnership of the innings thus far, seeing Head past 50 but not much further, as he was out LBW while shouldering arms Jasprit Bumrah’s third delivery with the new ball. That brought to the crease Mitchell Starc, who was unbeaten on 8 to end the day, and will resume alongside Head on Saturday.